The elegant Ethiopian wolf is the rarest canid in the world—and Africa's most threatened carnivore. Fewer than 500 individuals remain, and they survive in small, scattered, human-dominated mountain regions. 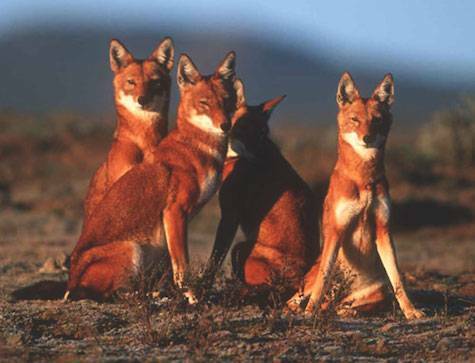 Born Free USA is proud to partner with the Ethiopian Wolf Conservation Programme (EWCP). The elegant Ethiopian wolf is the rarest canid in the world—and Africa's most threatened carnivore. Fewer than 500 individuals remain, and they survive in small, scattered, human-dominated mountain regions. Born Free USA has pledged to support the Ethiopian wolf's long-term viability. EWCP takes a successful, multi-faceted approach to conservation, addressing individual animal protection, strengthening communities, preserving habitat, and promoting appreciation of this national treasure. Monitor the recovery of the Bale Mountain National Park populations, including 20 focal wolf packs. Minimize transmission of rabies and canine distemper virus (CDV) to wolves by vaccinating 4,000 or more domestic dogs who live in wolf areas, and continue testing an oral rabies vaccine for the wolves themselves. Educate villagers about the risks of rabies and CDV through leaflets and celebrations, such as the annual Wolf Day and Rabies Awareness Day. Work with 13 targeted schools in critical habitat areas, providing exercise books, supporting small-scale conservation projects, and showing documentary films. Advance sustainable livelihood initiatives to reduce pressure on natural resources. EWCP is a vital part of the Ethiopian landscape. Wolves' lives are saved, progress is made on halting destruction of wolf habitat, and young people are engaged in the long-term conservation of these animals. Please donate $25 now to help these imperiled wolves!